Back in November of 2012, I had the pleasure of meeting Dennis Gilliam at the Hamilton Wood Type Wayzgoose. As someone with a past in typographic arts, we had a lot in common when it came to our passion for antique type and typesetting. 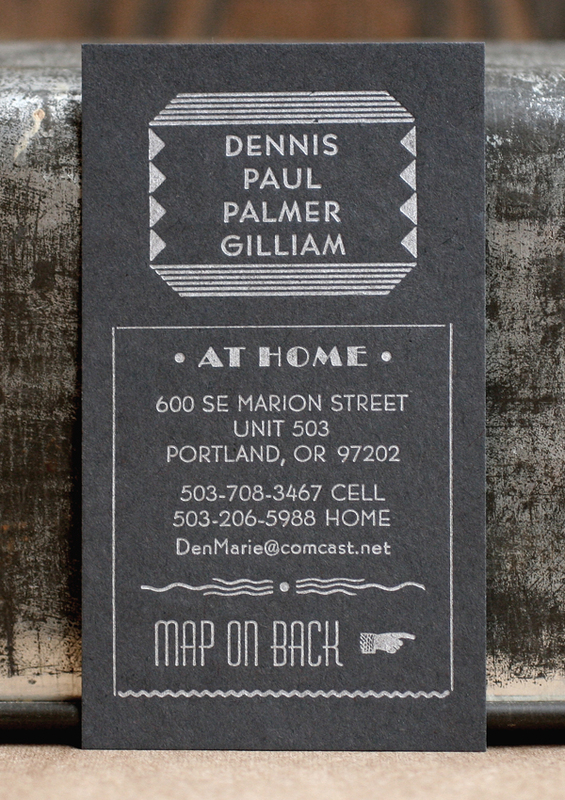 Apparently, I 'won him over' with Starshaped's commitment to only producing work with metal and wood type, and after traveling home to Portland after the 'Goose, he contacted me about creating calling cards for both himself and his wife. For his own card, he pulled heavily from the silent film/ragtime-inspired print in our self promotional packet and pieced together what he thought would look great on the card. Here's a shot of the form. It has a combination of mortised multi-line rules around the name, and a tricky set of rules to create a box around the main text. And since we were already working on one card, Dennis also ordered cards for his wife, an avid bonsai tree admirer. They provided this image, which I cleaned up to make into a magnesium plate and then combined with type. These are printed on 100% recycled stock. One of great perks of collaborating with Dennis? He's currently working with the fabulous Bob's Red Mill and sent coupons for their fabulous products! Granola? Flour for cookies or cakes? Any which way, the studio will be stacked with delicious treats.